This is the only drama I have seen in the Yoon Suk Ho’s four seasons dramas and I think I should have started with a different season…. Well I love Son Ye Jin, especially in the more recent “Personal Taste” but she was a bit flat in this series. I also really liked Ryu Jin who played the fiance’ and his sister played by Han Ji Hye. Overall the story was too slow. It started out very promising, but just crawled in places and the direction was not good. Basically the characters looked stupid, why couldn’t they figure out who the donor was and really it didn’t seem compelling as a reason for several episodes to be hinged on. Seriously, the audience is smarter and needs more tension than that. It would have worked for one maybe two episodes, but seriously that was the big issue for like 10 episodes. ugh! I hate thinking about it now. Song Seung Hun… sorry fans of this cute actor… but I thought he was terrible. I hated his hair, he should never be filmed running and he just didn’t turn me on. Seriously – even in 2003 sleeveless shirts on a professional architect. Really, sleeveless shirts period. Gross. The story was not believable and silly at best, really boring and dumb most of the time. The fact that the management team for a resort was made up of the boss, his sister, the architect and the florist. This stupid writing made me want to scream. They could have made her an interior designer with a love for flowers or an art director with a flower shop on the side, but really florists don’t play a major role in a renovation. I didn’t think that they had real chemistry. I just didn’t buy that they were in love. I’m not sure who is to blame for this, the actors, the writers or the director. It was all bad. I haven’t finished any of these series, but I have started Autimn, Summer, & Spring. 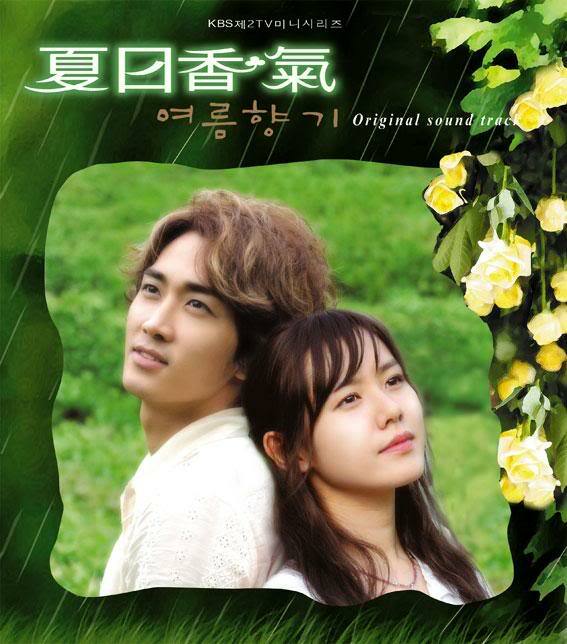 I believe Sutumn in my heart is seen as the best drama in the series. Truthfully, while I don’t hate them, they are in the same vein when it comes to unconvincing plots & romance.